The United States is dotted with cities readying themselves for performances by the Bill T. Jones/Arnie Zane Dance Company this coming year, beginning in Montclair, NJ, with Montclair State University’s semester-long celebration of the Jones/Zane Company. In addition to company performances, including the world premiere of “A Quarreling Pair,” the Montclair events comprise an exploration of Jones’s choreography as well as the work and contributions of his close collaborators. The Jones/Zane Company’s four-month residency at Montclair State University opens September 19 with “Acts of Engagement: Artist Special Forces,” a student address to be delivered by Jones on the rewards and difficulties of creating work that challenges audience and critical expectations. On September 26, the Jones/Zane Company’s composer-in-residence Daniel Bernard Roumain will lead a workshop and discussion examining the complex relationship between composer and choreographer; and on October 10, there will be a presentation and talk by the sculptor Bjorn Amelan about his own work and his collaborations with Jones. “Blind Date,” Jones’s penetrating examination of patriotism, which had its world premiere on the stage of the Montclair State University’s Alexander Kasser Theater in October 2005, will return to the Kasser on October 25. On October 27, the company will present “As I Was Saying,” an essentially solo work performed by Jones that recombines works from the past and present repertory including “With the Good Lord;” a reshaping of Jones’s 1983 talking solo “21,” now called “22;” and “Chaconne,” among others. A highlight of the Montclair season, the world premiere of Jones’s “A Quarreling Pair” takes place November 30, December 1 and December 2. “A Quarreling Pair” is the result of Bill T. Jones’s 15-year fascination with Jane Bowles’s four-page puppet play of the same name. In his hour-long production, Jones takes this apparently simple story of two sisters with polar opposite views of the world as a point of departure for a multi- layered theatrical exploration of what happens to a relationship lived in isolation. 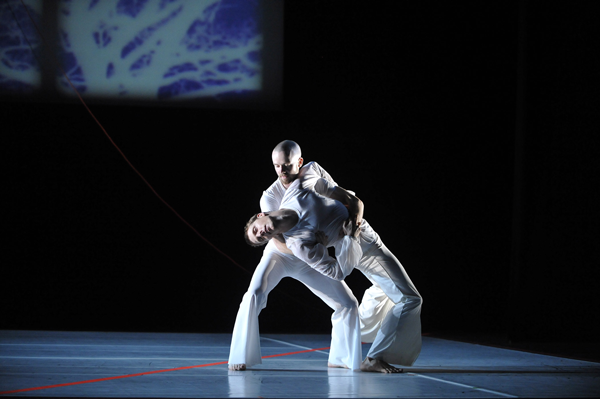 A combination of choreography, text, and an original score, the work creates a tension between the uniquely creative means Jones employs to explore a play that warns of the emotional suffocation and spiritual inertia resulting from a life lived without imagination and curiosity. In between the myriad events at Montclair and the opening of a series of talks, “Breaking Ground,” at Harlem Stage’s The Gatehouse on October 9, the Jones/Zane Company will be seen on tour throughout the United States. During the fall, winter and spring, the company has performances scheduled in 17 American cities covering the east and west, north and south. The Company makes its Taiwanese debut in Taipei, September 13-16 and performs in Canada in April 2008. Anselm Kiefer has invited Bill to create “Walking the Line” as part of the month-long series of events the German painter will curate at the Louvre, enitled Frontier. Jones will perform the solo along the 100-meter perspective stretching from the steps of the Winged Victory of Samothrace to the Renaissance Arch, which frames Michelangelo’s sculptures, “The Slaves.” Jones will be accompanied by the Tibetan singer Yungchen Lhamo and the French percussionist Florent Jodelet. About the Company: Clearly one of the most well traveled troupes in the world, the Bill T. Jones/Arnie Zane Dance Company was founded by Bill T. Jones and Arnie Zane in 1982, eleven years after the two artists had begun collaborating and working as a duo. With a repertory of over 140 works, the ten- member Company has performed in over 200 American cities and 30 countries, including Australia, Brazil, Japan, Portugal, Greece, Mexico, Italy, France and the Czech Republic. Audiences of approximately 50,000 to 100,000 annually see the Company across the country and around the world. Now based in New York City’s Harlem, the Company has been honored with innumerable awards including several New York Dance and Performance Awards (“Bessies”) for its 1986 Joyce Season, “D-Man in the Waters,” and for musical scoring and costume design for “Last Supper at Uncle Tom’s Cabin/The Promised Land.” In 1999, it was nominated for a Laurence Olivier Award for Outstanding Achievement in Dance and Best New Dance Production for “We Set Out Early…Visibility Was Poor.” The troupe has also been represented in and the subject of many documentaries, including “Uncle Tom’s Cabin/The Promised Land” for the Great Performance Series, “Bill T. Jones: ‘Still/Here’ with Bill Moyers” and the Emmy Award- winning “Free to Dance,” produced by the American Dance Festival. Prize, the 2005 Samuel H. Scripps American Dance Festival Award for Lifetime Achievement and the 1993 Dance Magazine Award, among others. His recent foray into off-Broadway theater (“The Seven”) resulted in his winning a 2006 Lucille Lortel Award, while his choreography for “Spring Awakening” currently on Broadway was awarded a 2007 Tony Award, as well as an Obie Award for the show’s 2006 off-Broadway run. Before forming Bill T. Jones/Arnie Zane Dance Company (then called Bill T. Jones/Arnie Zane & Company) in 1982, Jones choreographed and performed nationally and internationally as a soloist and duet company with his late partner, Arnie Zane. In addition to creating more than 140 works for his own company, Jones has received many commissions to create dances for modern and ballet companies. In 1995, Jones directed and performed in a collaborative work with Toni Morrison and Max Roach, “Degga,” at Alice Tully Hall, commissioned by Lincoln Center’s Serious Fun Festival. His collaboration with Jessye Norman, “How! Do! We! Do!” premiered at New York City Center in 1999. Television credits for Jones’s work include “Fever Swamp,” “Untitled” and “Last Supper at Uncle Tom’s Cabin/The Promised Land.” “Still/Here” was co-directed for television by Bill T. Jones and Gretchen Bender and aired nationally and internationally. The making of “Still/Here” was also the subject of a documentary by Bill Moyers and David Grubin entitled “Bill T. Jones: ‘Still/Here’ with Bill Moyers” which premiered on PBS in 1997. Jones’s work was profiled in the Blackside documentary entitled “I’ll Make Me a World: A Century of African-American Arts,” which aired in 1999. In 2004, ARTE France and Bel Air Media produced “Bill T. Jones–Solos,” directed by Don Kent. Jones is the recipient of the 2005 Harlem Renaissance Award, was named “An Irreplaceable Dance Treasure” by the Dance Heritage Coalition in 2000, and was honored with the Dorothy B. Chandler Performing Arts Award in 1991. In 1986, Jones and Zane were awarded a New York Dance and Performance (“Bessie”) Award for their Joyce Theater season, and in 1989 and 2001, Jones was awarded two more “Bessies” for his work “D-Man in the Waters” (1989), as well as for his “The Table Project” and “The Breathing Show” (2001). He has received honorary doctorates from the Art Institute of Chicago, Bard College, Columbia College, the Juilliard School, and Swarthmore College. The State University of New York at Binghamton, where he began his dance studies, honored him with its Distinguished Alumni Award. Jones’s memoirs, Last Night on Earth, were published by Pantheon Books in 1995. An in-depth look at the work of Bill T. Jones and Arnie Zane can be found in Body Against Body: The Dance and Other Collaborations of Bill T. Jones and Arnie Zane, published in 1989 by Station Hill Press. Hyperion Books published Dance, a children’s book written by Bill T. Jones and photographer Susan Kuklin, in 1998. Jones contributed to Continuous Replay: The Photography of Arnie Zane, published by MIT Press in 1999. In addition to “The Seven” and “Spring Awakening,” Jones’s previous work in opera and theater includes the choreography for Sir Michael Tippet’s 1990 “New Year” under the direction of Sir Peter Hall for the Houston Grand Opera and the Glyndebourne Festival Opera. He conceived, co-directed and choreographed “Mother of Three Sons,” which was performed at the Munich Biennale, New York City Opera and the Houston Grande Opera. He also directed “Lost in the Stars” for the Boston Lyric Opera. Jones’s theater projects include co-directing “Perfect Courage” with Rhodessa Jones for Festival 2000, in 1990. In 1994, he directed Derek Walcott’s “Dream on Monkey Mountain” for The Guthrie Theater in Minneapolis, MN. Jones is currently at work on a new musical about the life of Fela Kuti, the Nigerian musician and political figure. Jones will serve as both choreographer and director for the show.